Midway Village Museum is providing online access to some of its most requested photographs, postcards and documents. Find out how you can gain access to these cherished items. In this image made from a glass-plate negative, the race is about to start for these cyclists at Rockford’s fairgrounds (now Fairgrounds Park). This event may have taken place during the county fair typically held in September. 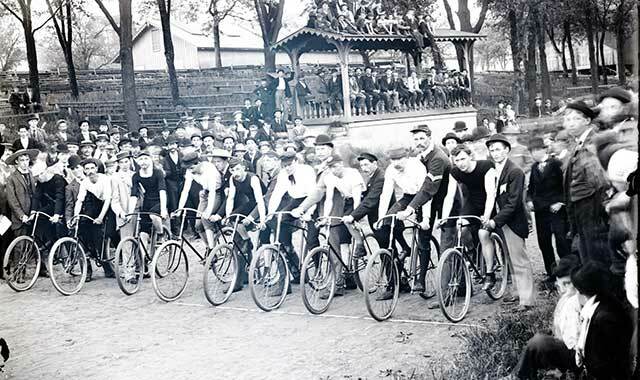 The Rockford Cycling Club was founded in 1891 with headquarters at 604 W. State St.
One of the great benefits of the digital age is widened public access not only to current data, but also to information from the past. Midway Village Museum, 6799 Guilford Road in Rockford, is among the forward-thinking organizations digitizing historical collections and posting them to the internet. Since January, the museum has scanned, watermarked and posted more than 900 items to midwayvillage.com/digital-collections.html. Hundreds more images will be added as the project progresses through its first phase, with more phases to follow. Grant money has allowed the museum to purchase a scanner better suited to these negatives. Also among the 900 items are 500 postcards of central Rockford and Camp Grant, 70 letters written by Rockford boys as they fought in the Civil War, and two dozen interview transcripts from Rockford immigrants and their descendents that were made during an oral history project. The website is keyword searchable. High-resolution, non-watermarked copies of images are available upon request for $2 each. “The watermarks allow us to keep some control over our collection,” explains Furman. The digital project puts Midway Village Museum in the company of respected organizations like the Smithsonian and the Chicago Historical Museum. A contracted employee has been dedicated to the digital project for 32 hours per week since May. Museum leaders believe the easier access will aid general researchers, teachers, history buffs, individuals tracing their ancestry and businesses researching their roots, among others. In the past, the museum’s local history collections – which include some 150,000 items – have been available to view by appointment only. Of those 150,000 items, about 21,000 are photographs. About 2,000 of them will be posted in the first phase of the project. The museum also hopes someday to post images of three-dimensional items, such as tools, clothing and toys. The 500 postcards put online so far are mostly from the 1910s to 1920s. They depict Camp Grant, Rockford streetscapes and major landmarks such as theaters and courthouses. This entry was posted on Tuesday, September 12th, 2017 at 11:59 am	and is filed under Recreation & Destinations. You can follow any responses to this entry through the RSS 2.0 feed. Both comments and pings are currently closed.